Progress only comes with practice. Think about it. How do you master any skill? How do you learn a new language or a musical instrument? How do you get good at cooking or tying your shoes or driving a car or playing chess? Practice! You have to be awful at everything before you can be great at anything. In the the messy middle when the learning is hard and you’re failing and you are tempted to quit, you need to remember that progress only comes with practice. Do your best with the skill and time you have. Allow yourself the luxury of being good enough as you become more accomplished. I’m done missing out on the fun of meeting new people and having new adventures because I’m afraid I’ll fail or look foolish. If you are, too, then replace the lie that perfection (this side of heaven) is achievable. Let go of the fear that you can’t try anything unless you are sure you’ll be really good at it. The Bible says do not be afraid over 300 times, because fear, specifically the fear of imperfection, is a weapon the enemy uses relentlessly to keep you scared and small and isolated!! God is certainly powerful enough to teach you new things and redeem any mess you make in the process of progress! 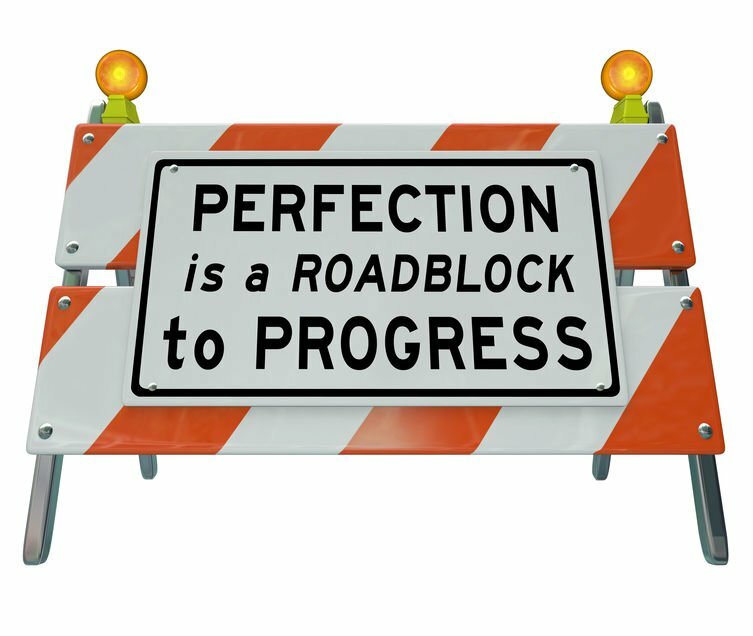 I’d love to hear what new thing you’re practicing as you shuck off perfectionism. Leave me a comment below. I’ll respond to as many as I can. Prayer: God Almighty, strip the lie of perfection from me. Restore me to do good work, and assure me that it is good enough as I do my best. Guard my heart and mind from believing that I am not worthy or that I must achieve to be accepted. How did you know I have been accused /complimented on my perfectionism. Thank you for sharing this piece of your life with the double-edged sword that pierces the heart and cuts the mustard! Your book is being passed around Chilton area. I appreciate the courage and perseverance God walked you through graciously to get your life in print. AMDG! Ad Majoram Dei Gloriam from J.S. Bach written on all his compositions. All for the honor and glory of God. Thanks for writing. To God be the glory indeed.